Obed ministers primarily to the B* & L* people groups. By the grace of God he was able to plant three churches last year, with a total membership of nearly two hundred. Until then, these communities were without a church. African Traditional Religion and Islam were the only faiths practiced before Obed and his team arrived with the Gospel of Jesus Christ. We praise God for the lives of our gallant workforce who defy all odds to bring the Gospel into these hard places. During one of his visits, several new believers brought their old idols to the team for them to burn. They were giving up their old ways to follow Jesus! As for COF’s missionaries to the F* people group, Issa and Fati, they participated in a discipleship training in July last year. They have since used the skills acquired at that training to form two discipleship groups in their respective villages. The two groups are about twenty-five in number and are comprised mostly of Muslim women. At our church planter training in November, Issa and Fati shared with their fellow missionaries on how to use these tools to make disciples among unbelievers. 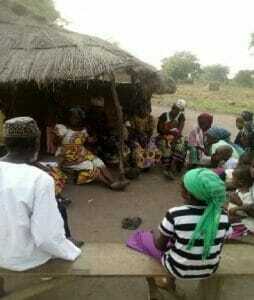 This photo is Fati leading a meeting of one of the Muslim groups she ministers to.